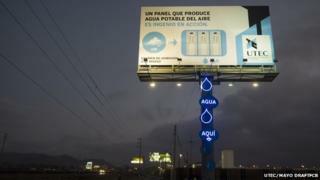 Just outside Lima, Peru, a billboard provides drinking water to whoever needs it - mainly, its neighbours. The panel produces clean water from the humidity in the air, through filters. Researchers at the University of Engineering and Technology (UTEC) in Lima and advertising agency Mayo Peru DraftFCB joined forces to launch it. UTEC says it wanted to put "imagination into action" and show that it is possible to solve people's problems through engineering and technology. "A billboard that produces drinking water from air," says the billboard up high. And it does what it says on the tin: so far, the billboard has produced over 9,000 litres of drinking water - 96 litres a day. The panel is strategically located in the village of Bujama, an area south of the capital city that is almost a desert, where some people have no access to clean water. Despite tough conditions with little rain, air humidity reaches 98%, says UTEC. "The panel traps humidity in the air and transforms it into water. It's that simple," said Jessica Ruas, a spokesperson from the university. "There is a lot of water. It is right there in the sea, but it is not suitable for drinking purposes, and costs a lot of money to process it." Ruas says the system might become a wider solution for the problem. "It doesn't have to come in the shape of a billboard, but ingenuity is key to development". Internally, the panel consists of five devices that extract water vapour from the air using a condenser and filters. Water is stored in tanks at the top of the structure. Once filtered, it flows down a pipe connected to a tap, accessible to everybody. The internal system costs some US$1,200 (£790) to set up. On the publicity side, the panel itself seeks to attract the "creative minds that Peru needs" to the young UTEC, which was founded only a year ago. "We want to change the minds of future engineers and inspire them," said Ms Ruas. The neighbours have given the billboard a warm welcome. It has become a local attraction for and motorists and an indispensable part of life in the local village. "We hadn't realised how big the impact would be," said Ms Ruas.